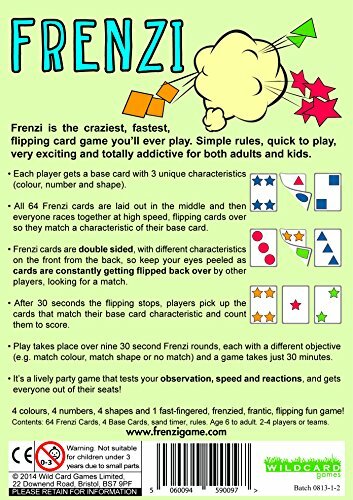 Frenzi is the craziest, fastest, flipping cards game you'll ever play. Simple rules, quick to play, very exciting and totally addictive for both adults and kids. 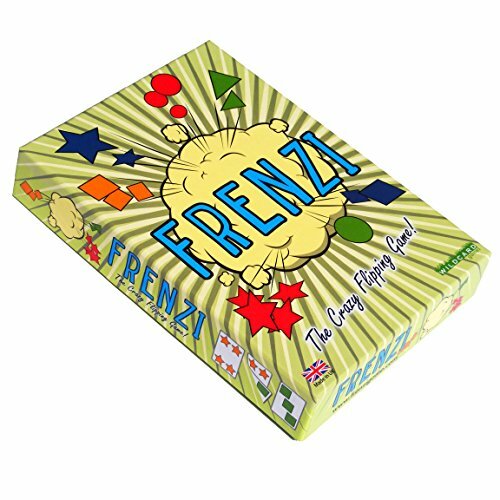 Play takes place over nine 30 second Frenzi rounds, flipping DOUBLE SIDED cards against your opponents at top speed. Each round has a different objective (e.g. match colour, match shape or no match) and a game takes just 30 minutes. It's a lively party game that tests your observation, speed and reactions, and gets everyone out of their seats! 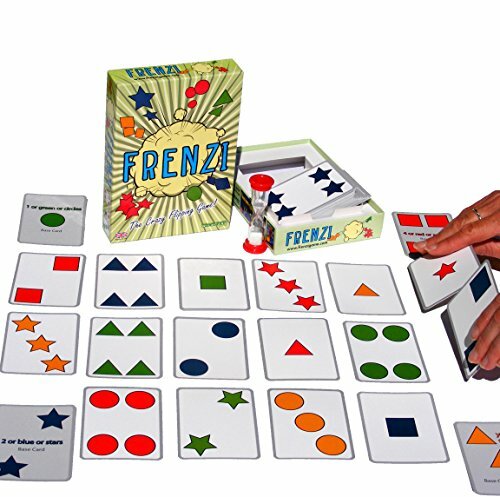 4 colours, 4 numbers, 4 shapes and 1 fast-fingered, frenzied, frantic, flipping fun game! MAPOMINOES EUROPE – The Ultimate Geography Game – Fun and educational travel card game for kids teenagers and adults. Like dominoes with maps. SKYJO, by Magilano - The ultimate card game for kids and adults. 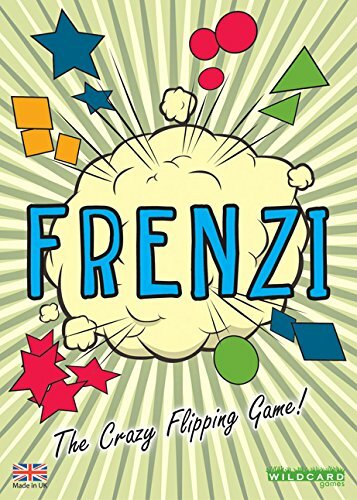 Frenzi is the craziest, fastest, flipping card game you'll ever play. Simple rules, quick to play, very exciting and totally addictive for both adults and kids. Each player gets a base card with 3 unique characteristics (colour, number and shape). 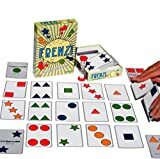 All 64 Frenzi cards are laid out in the middle and then everyone races together at high speed, flipping cards over so they match a characteristic of their base card. Frenzi cards are DOUBLE SIDED, with different characteristics on the front from the back, so keep your eyes peeled as cards are constantly getting flipped back over by other players, looking for a match. After 30 seconds the flipping stops, players pick up the cards matching their base card characteristic and count them to score. Play takes place over nine 30 second Frenzi rounds, each with a different objective (e.g. match colour, match shape or no match) and a game takes just 30 minutes. Like Dobble meets Jungle Speed - It's a lively party game that tests your observation, speed and reactions, and gets everyone out of their seats! 4 colours, 4 numbers, 4 shapes and 1 fast-fingered, frenzied, frantic, flipping fun game! Age 6 to adult. 2-4 players or teams.